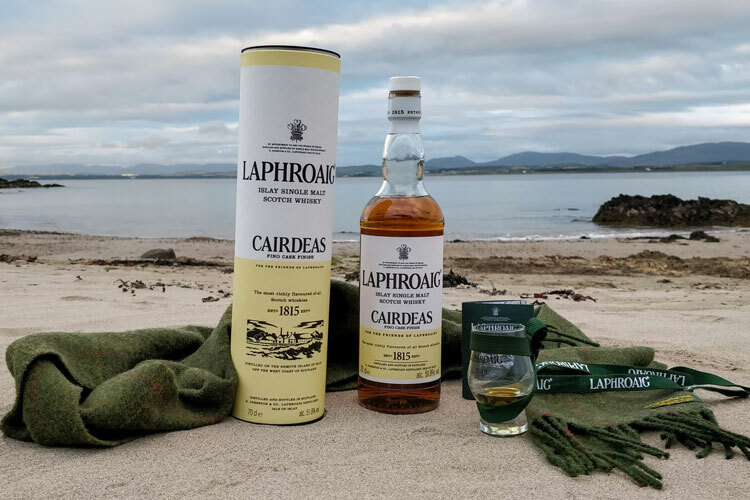 We’ve already covered the Laphroaig with an in-depth distillery overview as well as a review of the 2018 Cairdeas expression. However, with it being admittedly among my favourite Scotch expressions, I felt compelled to explore the infamous 10 Year Old single malt. Download the Laphroaig 10 Year Old Whisky Matrix as a PDF. Laphroaig’s 10 Year Old needs no introduction as it’s a renowned Single Malt. A marriage of Glenmachrie peated malt and the Kilbride Steam’s heathery waters, the 10 Year Old continues to divide opinion with its daringly bold flavours. Founded in 1815 on the Isle of Islay, Laphroaig continues to produce its own maltings today. Its infamy is worn with a badge of honour and has given birth to Laphroaig’s #OpinionsMatter marketing campaign. With a medium caramel hue that’s reminiscent of an aged Sauternes white, you’d expect a particularly light-bodied expression. Swirling the whisky in my Glencairn’s glass, I also noticed some quite thin and surprisingly slick legs that trickled quickly to the base. Meanwhile, a few drops of water created some beautiful swirls that curled under the droplets. This promises a high viscometric potential and indicates a non-chill filtration. Laphroaig instantly reveals its deceptively full body once the nose is close to the glass. A burst of brine fill the nostrils alongside thick peat smoke and chewy liquorice. The bouquet is intense and complex while remaining relatively concentrated on its select aromas. Nevertheless, it’s a vivid experience with characteristic Hebridean notes. Overall, we have a unique blend of sweet and salty flavours that marry across the palate. Opening with a detonation of medicinal TCP notes followed by smoking cordite, succulent dried figs briefly reveal themselves before sinking under fiery spices. The iconic TCP note persists into the heart and interacts with sharp aniseed and warm cardamon spice. There’s a distinctive note of charred coal that tingles the palate and coagulates the saliva. The mouthfeel is quite peppery due to the spicy notes but also reveals a furry fabric texture that dries the mouth. It’s surprisingly velvety yet youthful in nature. Finally, we draw towards a long finish of peat and brine that are reminiscent of heavily-smoked kippers. There’s a distinctive note of birch tar as well as something I’d liken to smouldering rubble the morning after the distillery burned to the ground. Being at a low 40% ABV, this is a Scotch that can indeed be enjoyed neat. Nevertheless, it’s the heavy peat notes rather than the alcohol bloom that renders it rather strong. However, I found that adding a few drops of water considerably improved the flavour and opened up a plethora of aromas. With its brash and bold flavours, Laphroaig may not be an easy expression to pair with meals. However, I’ve come to enjoy it with thick, dark chocolate. Furthermore, it may indeed marry well with chargrilled red meat such as a bloody rib steak with a crusty exterior. Otherwise, you could likely enjoy it with thoroughly-smoke seafood. A kipper would be great but I’d recommend it with an Arbroath Smokie if you know where to get one. Finally, cigar smokers ought to consider heavier, full-bodied sticks in order to complement Laphroaig’s rich palate. A well-aged Maduro cigar would be ideal but I really enjoyed this with a “The Late Hour” Churchill from Davidoff. Presented in the iconic black-on-white matte paper label that echoes the distillery’s facade, Laphroaig is instantly recognisable. Bold lettering is evenly spaced with the Royal Warrant proudly presented at the top. The tube is quite similar with a white matte paper finish as well as green strips at the top and bottom. However, there’s also a stencil-style silhouette of the distillery beneath the founding year. As for the cork, it’s of solid quality and encased in an attractive white cap that bears the silhouette of a still. In terms of occasion, this is a whisky that can be drunk anytime, anywhere. 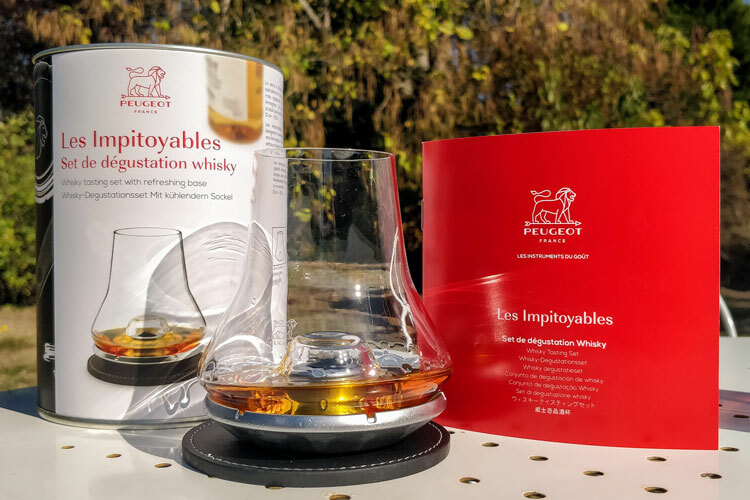 It’s perfectly suitable as either a casual or formal dram that you can enjoy along or among friends. Similarly, it’s quite affordable if you know where to look. In the USA, it retails for around $50 whereas I picked up a bottle for 30€ in France. However, our alcohol has a tendency to be much cheaper! Shameless and unapologetic, Laphroaig is an archetypal expression from Islay. It’s heavy notes of smoky peat and brine have fuelled its reputation, leading it to become cherished by some yet loathed by others. If you’re seeking the quintessential Islay single malt, it may be argued that this isn’t it. In fact, you could probably regard it as a caricature of the island’s whisky rather than the definitive expression. Nevertheless, this is an obligatory expression to be owned by any whisky enthusiast, experienced or otherwise. Indeed, some will claim that this isn’t a beginner’s dram. However, if you’re looking for an unforgettable experience, Laphroaig’s 10 Year Old single malt will certainly help there. Reviewed by Charles-Philippe, on 10th October . 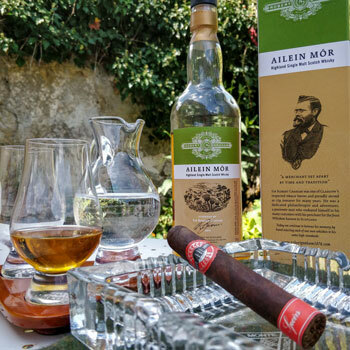 "A rich and peaty experience. As if someone used barrels of gunpowder to blow up a whisky distillery that sank into the sea. The marriage of brine, peat and pungent spices is an experience to be lavished." This is one of my favourite whiskies! I love peaty island scotches and it was Laphroaig that first opened my eyes to them. Do you drink it neat or with a drop of water? Oops, I omitted to mention that. I’ve gone back and edited it. But to answer your question, Laphroaig is one that I can appreciate neat despite it’s full body. However, I do enjoy it more with a few drops of water. Me too, actually! It was the Scotch that really introduced me to Islay and the Hebrides. Do it, Carlos! You can’t go wrong! Well, you could but it’s worth it! A true peat beast. The 10 year old used to come un-chill filtered and without the fake “E150” tan. Shame really, the filtering and caramel coloring seems to have taken something away from this bottling. And a drop in the ABV, what is Laphroaig thinking?! The market demands what it demands i suppose. There are a few options for independent bottlings of the 10 year old that arent overly engineered, but can be a bit tougher to get ahold of, but worth it, especially when doing a side by side tasting between the original bottling, and the non-chill filtered, non-colored independently bottled version. Great revkew, spot on. Great comment and really interesting to read. I was aware that Laphroaig coloured their whisky like a lot of distilleries – I can tolerate it as it’s so common but I’m not overly fond of the practice. However, I didn’t realise that it was chill filtered! I’ve done a little research as there’s a lot of contradictions with some saying that it is and others saying that it isn’t. In adding water, I noticed the viscometric whirls, which hints at it being non-chill filtered. However, I’ll have to give it an evaporation test overnight and see the residue the next day.